We are very proud of the strength of our offering and achievements, which have been externally recognised by a number of partners and organisations. We are pleased to have won outside approval and endorsement for our distinctive and progressive public value led agenda, our teaching and our research, meeting the standards of some of the major international assessors and accreditation bodies. AACSB accreditation is a hallmark of business school excellence. Awarded to less than 5% of the world's business schools, we are the only business school in Wales to have been accredited by AACSB. This prestigious accreditation assures students and parents that the business school is providing a top-quality education and confirms to employers that our graduates are ready and able to hit the ground running. It also ensures that the school has a commitment to continuous improvement through a cycle of review every five years. To find out more about what studying at an AACSB-accredited school can mean for you, please visit the AACSB website. We are an approved centre of the Chartered Institute of Personnel and Development (CIPD). Membership demonstrates a commitment to high standards of professionalism in the human resources sector. All graduates of the MSc in Human Resource Management are automatically eligible for Graduate Membership of the CIPD, a qualification required by most employers for UK Human Resources positions. Graduates who have two years' professional experience gained whilst working in an HR department may upgrade their membership to Chartered Member of the CIPD. During their studies, students can also benefit from student membership, which provides access to all CIPD online resources and means that they can attend meetings of the South East Wales CIPD branch to network with practitioners. A member of the local CIPD branch attends the MSc programme induction to give information on the benefits of CIPD membership and the branch offers a Best Student prize to the most promising student. The prestigious Small Business Charter (SBC) award is a national kitemark which recognises business schools that demonstrate excellence in promoting student enterprise, engagement in the local economy and business support. We are one of only 36 schools across the UK and Ireland to receive the mark of excellence, and bring our unique expertise to the SBC network by sharing knowledge, ideas and developing best practice in the fields of enterprise, entrepreneurship and business engagement. The Small Business Charter website connects small businesses. The website is a hub which provides business advice and support from the 36 business schools which have achieved their award. In addition to our formal accreditations – at School and programme level – we are also signatories of a range of initiatives supporting progressive and responsible management. We achieved the Bronze Award in late 2014 in recognition of our progress and commitment to gender equality, with particular focus on the under-representation of women in senior roles. 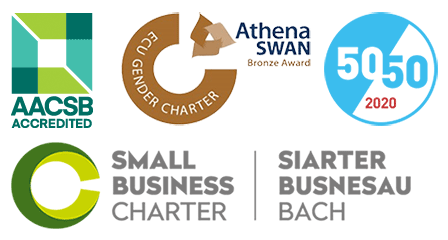 The Athena SWAN Charter recognises and celebrates good employment practice for women working in various disciplines in Higher education and research, from science and engineering to the arts and humanities. One of the key commitments in our Athena SWAN Action plan was the creation of the Shadow Management Board. We became a signatory of the UN Principles for Responsible Management Education initiative in 2016, one of only four Welsh institutions amongst its members. PRME and its six principles aim is to establish a 'process of continuous improvement among institutions of management education in order to develop a new generation of business leaders capable of managing the complex challenges faced by business and society in the 21st century'. The UNPRME’s mission to inspire and champion responsible management education fully aligns with our Public Value ethos. We became a signatory of the 50:50 by 2020 campaign in 2014. The campaign’s objective is to ensure that organisations and companies strive to provide gender equality and a workforce more reflective of society’s changing demographics. The population of Wales is close to representing a 50/50 split between the sexes while senior decision making roles in business – private, public and third sector – do not currently reflect this parity. We are proud to support the campaign and are committed to building a culture within the School that improves representation and progression for staff and students alike. Our pledge to the campaign reflects our commitment to equality and diversity which has been recognised by the Athena SWAN Bronze Award.